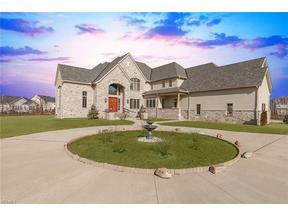 Welcome to this 6BR, 4 car garage "one of a kind" Custom Masterpiece nestled on 3+ acres in the heart of Avon! The finishes & upgrades of this home are endless. You will be greeted into the 2-story foyer, w/winding wrought iron stair case, Afyon cream marble flooring throughout & a crystal chandelier w/an automatic lift system. The Dining room showcases a gorgeous tray ceiling w/ Waynes coating throughout. The outstanding open floor plan is breathtaking. The 2-story Great room offers a gorgeous fireplace, beautiful columns throughout & plenty of natural lighting. The chef in you will love preparing in the gourmet kitchen which offers a large center Island/Breakfast bar, high end appliances and granite tops throughout. The family will love relaxing in the Hearth room which offers hardwood flooring & fireplace and a french door to access the covered porch. The first floor Den features amazing wood built-ins throughout, hardwood flooring & double french doors. First floor laundry & mud room are spacious & all closets contain Closet Factory design systems. This home offers a first floor BR w/full bath that can be used as an In-Law suite. You will love entertaining your guests in the lower level which features a complete with eat-in kitchen and granite island, family room, wet bar to seat 4 w/wine refrigerator, egress windows, a complete home theater & audio/media room. The pool house is fabulous, which features a heated pool, full bathroom & 8 seated hot tub. Call today to view!